No post in the last week because I've been traveling for work. However prior and post I've been doing a bit of working to update the Tau army. Fist off I thought I'd just do up a conversion from a bunch of gun drones I've had into makerlight drones. 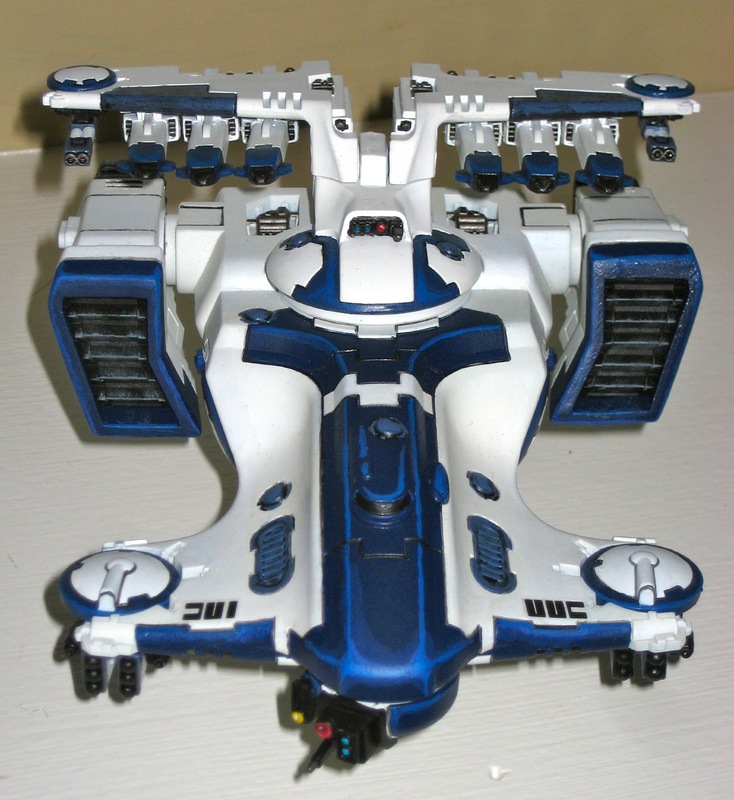 For whatever reason GW thinks not to have different version of drones in a box. 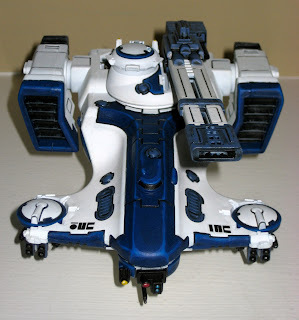 Instead you get gun drones with just about every Tau purchase and Gun drones almost nowhere (Pathfinders and Stealth teams). So rather than buying 4 more maker drones on a bits store I decided to just cut up the gun drones since I have plenty. Essentially I just cut the carbine on one side down quite a bit and added a Target Array on the other side. This was all pretty quick and easy and just took and hour or two to do and touch up with paint. I'd still like to spend more time doing things like drybrushing the black but I've got too much to do and too little time! I also tackled my two tanks. First I just updated my Hammerhead tank. All pretty straight forward on this. Mostly I was cleaning up lines and adding to the highlight. The grey parts also got washed and highlighted to add depth. I also cleaned up the bases a bit to be in style with the Crisis suits I did last month. Next we had to update the skyray chasis and paint the actual missile turrent as well. Same techniques, just a bit of extra time to make the tank look a bit better. I also added some extra details like the engines on the rear top which were just white previously. Here you can see the base cleaned up a bit and with the dark grey trim. Overall the tanks do look better though there is still plenty I dislike about them. 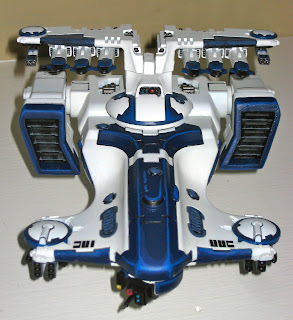 The biggest thing that stands out is how poorly some of the construction was, and the paint scheme itself is not my favorite. But I'm pressing ahead and moving to a totally unpainted model this week... the Riptide! Hopefully I can get that done, make him look nice, and stay on plan to get the army updated! Ya, they are not great. Really the whole army isn't great. But at this point I'm just trying to make them a consistent table top army. They'll never do horribly well in a painting category.